W h o w e a r e .
Sonic-Space, based out of Portsmouth, NH and serving North America is a nationally recognized designer, builder and integrator of critical acoustic spaces. 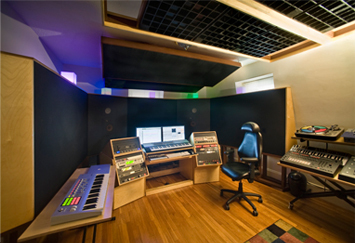 We are developers of creative spaces that require our experience in acoustics, engineering and architecture. We have a proven track record of truly listening, then providing solutions for new and existing spaces, transforming them into comfortable and harmonious environments. F o l l o w u s .
Interested in keeping up with the latest updates from Sonic-Space? Then follow us on Facebook, Twitter, or myspace. Use the buttons bellow to visit our corners of the social networking scene.